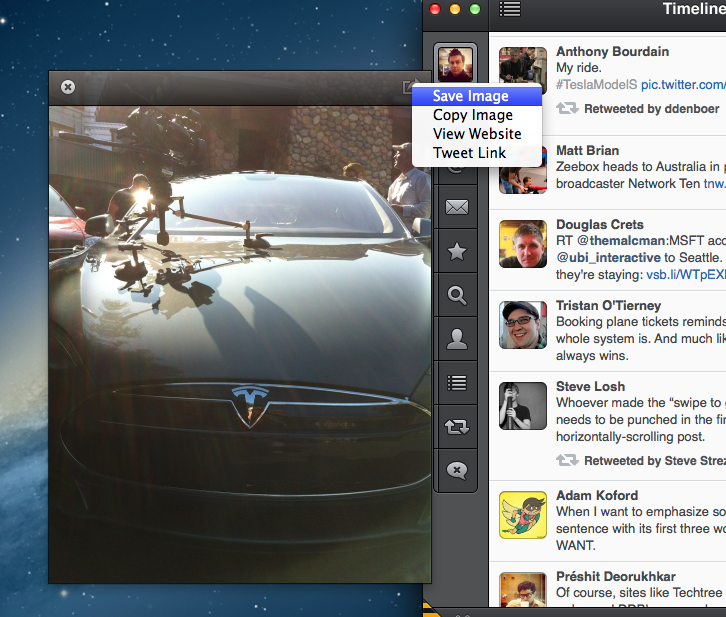 If there’s a Mac app that has been as hotly anticipated as Tweetbot for Mac, I can’t remember it. As the premier Twitter app on Apple’s iOS platform, it has set the standard for how third-party clients should look and work. The demand for the app is so high, in fact, that the creators of Tweetbot have decided to release the Mac version even before it is completely finished, as a public ‘alpha’ test, and you can download it now (mirror link). I’ve been using the alpha version of the app for a couple of weeks now and it’s pretty fantastic. There are some rough edges to work out still, but that’s not surprising, given that it is a very early and unfinished version of the app. Even in its current state, however, it’s far superior to Twitter’s official client for the Mac, which has been dying on the vine since its creator Loren Brichter left Twitter. The app has a very similar look and feel to Tweetbot for iPad, so it should be familiar to anyone that has used that, or the iPhone app for that matter. The crisp designs that people have come to expect from Tapbots designer Mark Jardine are in effect, although the studio says that all of the pixels have yet to be pushed, so there will be little issues here and there. 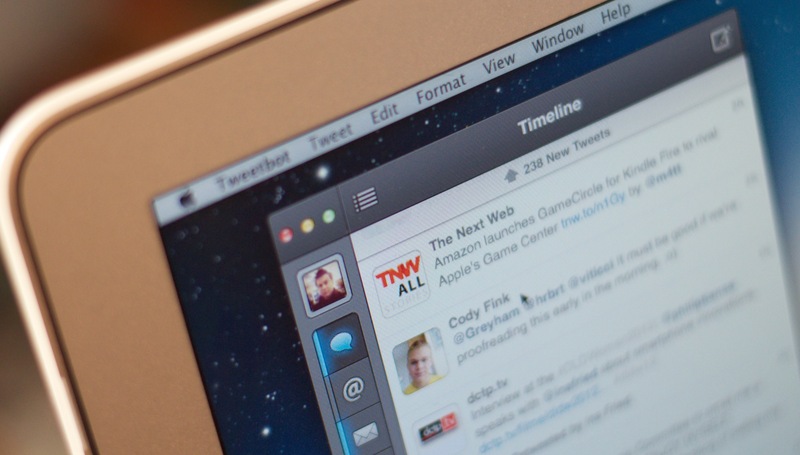 Tweetbot says that it even brought on a new team member to build Twitter for Mac, Todd Thomas. The app fully supports streaming and pinning to the top of the timeline, allowing you to watch as your stream of tweets flows by. All of your standard settings are there, including your choice of image uploaders, although there is no custom support as of yet. You can choose from read it later, shortening and video upload services though. At the moment, Tweetbot for Mac alpha does not support notifications or iCloud syncing, as these services require that the app be signed and published via the Mac App Store, and Tapbots is not yet ready to submit it. Those services will be integrated fully into the final release version of the app. There are a handful of keyboard shortcuts available, including a crude timeline duplication via Command+ Shift+N, though they say that the final duplicate column mode will be more elegant. Command+1-9 will activate each section of the app, but that’s about it. Adding more keyboard shortcuts is still on the roadmap for now. 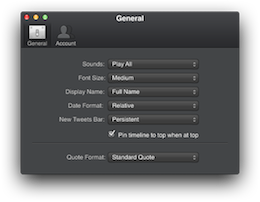 The basic arrow key functions of Twitter for Mac are present here, and you can navigate through your timeline or into the detail view of a tweet just by tapping those around. The detail view of a tweet offers all of the normal options including copying a link, retweeting and more, and those can all be accessed right in the main timeline as well. Images are previewed inline, with a dedicated media viewer popup that also allows for sharing directly. Clicking on an avatar will take you to a detailed profile view with all of the usual stats and an embedded timeline view. 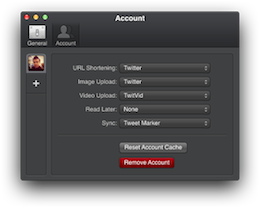 Multiple accounts are supported, as are all of the standard Tweetbot features like muting by keyword, client, person and hashtag. Retweets by others, lists, your profile, the new unified search, your favorites and replies fill out the sidebar. The direct message section holds a characteristically huge history of DMs, something that the iPhone and iPad versions of the app also excel at. 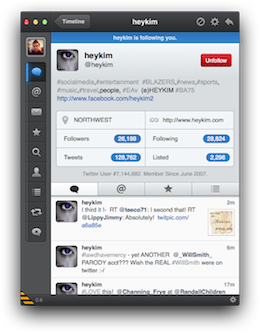 If you’re a person who gets and sends a lot of DMs, this is without a doubt the best Twitter client ever for you. 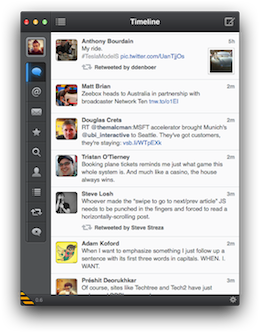 As I mentioned before, there are definitely still some quirks with this version of Tweetbot. Tapbots acknowledges this and says you can help them track down bugs by using the Help>Send Feedback option from Tweetbot for Mac to report them. Note that they say there may be ‘disturbing graphics and performance issues’ as they are still very much working on the app. The icon isn’t final, by the way, and performance is one of the last things to be worked on, so don’t worry too much if it’s a bit sluggish from time to time in its current state. We had the chance to talk to Tapbots’ Paul Haddad just briefly about the release of Tweetbot for Mac, even though he was busy sitting in a hotel room on vacation, launching an alpha while his family was out getting a tan. Matthew: Tapbots has a reputation for aggressively polishing its apps before release. I’ve been using the Alpha for a while now and I feel that it is very good, but there are definitely still some rough edges. Why was it that you chose to release it so early? Paul: We wanted to do something different, we can’t really do any wide scale alpha/beta testing on iOS and so that’s never been an option. We’ve also gotten so many requests for Tweetbot for Mac that we felt even an incomplete product would be really appreciated and useful for lots of our users. Doing an Alpha also let’s us get lots of feedback on what’s important for people and we can make the first paid release even better. Matthew: Bringing on another member of the team couldn’t have been easy, as you and Mark have worked together so long. How did you go about finding Todd [Thomas] and what made up your mind to have him join the team? Paul: I’ve know Todd for close to 15 years now and I trust him. An app like Tweetbot is a fairly complex undertaking and you need someone who has been working with the Cocoa frameworks for a long time to do it justice. Todd’s was also asking me for a while to let him to do the Mac port of Tweetbot, so it was a pretty easy choice. Matthew: Now that you’ve got, nearly, your first major Mac app in the Tapbots stable ready to go, what are your thoughts on developing for OS X versus iOS? Paul: I really wish the UI frameworks of iOS and Mac were more aligned. The low level “model” code is nearly identical between the iOS and Mac versions of Tweetbot, but the UI all had to be done from scratch. Unfortunately AppKit is getting a bit long in the tooth and doing fancy animations and smooth scrolling isn’t quite as easy as on iOS. Mac OS X 10.8 improves on this situation but I think its getting close to a time where Apple needs to look at fully re-hauling or retiring AppKit for something closer to the UIKit available in iOS. We asked Haddad if the early release of Tweetbot for Mac had anything to do with the ambiguous attitude that Twitter has been taking toward third-party clients. He declined to comment. If we were betting individuals, though, we’d see the Tweetbot alpha as a sort of ‘in before close’ effort to get it on the market before Twitter decides to shut off third-party apps forever. Note that since this is an alpha version of the app, there is no support being provided and that you use the app at your own risk. It is being provided free of charge, though the final version will be sold on the Mac App Store at an undetermined price. If you care to grab the alpha now, it will get automatic updates until the full version is released, at which time it will expire. The app is mostly Retina ready, and it supports OS X 10.7 and 10.8 in alpha. The shipping version will be 10.8 only.